The 330 P4 debuted in 1967, the culmination of a development dating back to 1964. Ferrari may have missed a beat when Cooper turned F1 back to front but he was not going to make the same mistake in sports cars too. Ferrari had the mid-engined Dino 246 SP competing on track in 1961. Then came the Ford merger talks in 1963 and the subsequent threat from the GT40. Ferrari were already campaigning the 250P by then and put considerably effort into its development. Ferrari won the last ever le Mans for a front engine car in 1962 (330LM spyder) and the first for a mid engine car in 1963 with the 250P. Such dominance was shown across most of the race tracks of the world and Mr. Ferrari was determined that it should continue. The 330P of 1964 was the start of the line where the Lampredi V12 long-block engine was put in the back of a new chassis and all methods possible to keep Ford off the podiums were going to be tried. Over the next few years Lucas fuel injection and intakes were mounted directly on the cam covers, fiberglass doors were used, marking the first time Ferrari used anything other than metal alloys, ventilated disc brakes were fitted and the latest five speed ZF gearbox was employed with the clutch between the engine and gearbox rather than at the very back as it had been up till then. 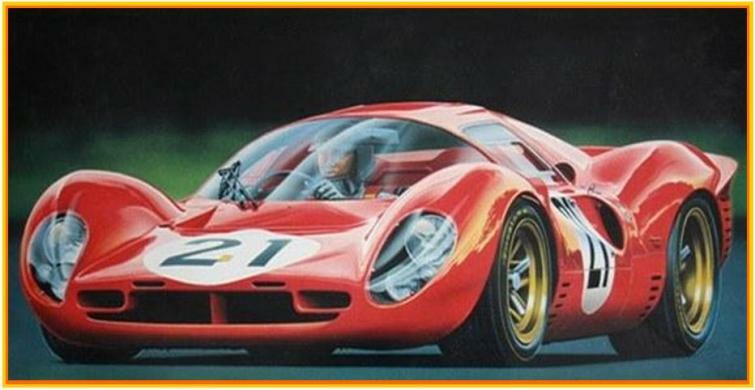 For 1967 the curvaceous, sleek, low lines of the 330P3 (originally penned by Piere Drogo) were further refined. The 339P4 is now considered one of the most beautiful Ferraris ever designed. It might have been beautiful to behold but it also possessed an aggressive demeanour. Three chassis were originally built, under the guidance of Technical engineer Mauro Forghieri, and gave Ferrari a splendid result in the Daytona 24hr race of 1967. Ferraris finished 1-2-3 in Ford back yard and avenged the defeat at le Mans the previous year when the Ford GT40 won. Chassis numbers 0856, 0858 and 0860 were all designed and raced as close coupes originally. Rule changes in Europe made the 330P4 redundant at the end of the 1967 season, but in an effort to keep the cars racing they all underwent a variety of changes to compete in different forms of motor racing around the world. Two were extensively altered to conform to the CanAm rules configuration in 1968. Only one original car remains today. Our car wears the numbers of the 1967 le Mans second place car of Mike Parkes and Ludovico Scarfiotti, Ferrari 330P4 number 21. Following the succes of Heller's 330P4 (and the less well known Union re-release thereof) it was a while before anyone else tackled the 330P4 subject. Fujimi released this kit, no.12104, in 1989 (and again in 1990 with different decals). It is a peach of a kit and generally builds into a very nice model. Fujimi were at the forefront of adding photo-etch parts to their kits and this one of those early kits. Built from the box in December '07 Rod used Halfords acrylic car spray paint for the body finish and Humbrol enamels and acrylics for the detail painting.